Bye-bye pulled pork on Bimini bread. Hello wood-grilled meats, seafood and contemporary American cuisine. Andy’s Live Fire Grill and Bar opens at 5 p.m. Friday, Dec. 28 in Fort Lauderdale at the former longtime home of Ernie’s Bar-B-Q. It ain’t “Dirty Ernie’s” no more, making some real design and cuisine changes to say the least. 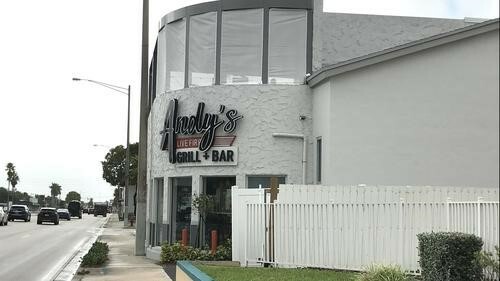 With a spiffy white exterior, second-level deck and sleek windows overlooking the busy South Federal Highway corridor running from the airport to Southeast 17th Street, Andy’s is the latest venture from successful Fort Lauderdale restaurateur Anthony Bruno. Bruno started Anthony’s Runway 84 with his late father and co-founded Anthony’s Coal-Fired Pizza. “Live fire” refers to the restaurant’s wood-burning grill in the open kitchen, which perfumes the 90-seat dining room with the sweet smell of red oak. Another 60 seats are located on the second floor, which features two bars (inside and on a deck covered with artificial grass) and a relaxed vibe. Bruno says the restaurant will offer dinner nightly (4-10 p.m., until 11 p.m. on weekends), with lunch service starting in a few weeks. Weekend brunch eventually will be offered, Bruno says. Bruno says he wants Andy’s to be “a neighborhood place” that appeals to locals and families. “A place where you can get a house-smoked pastrami sandwich for lunch or a good steak for dinner,” Bruno says. A signature item will be tri-tip steak for two Santa Maria style ($45), with pinquito beans and pico de gallo. The menu features raw oysters (market price), clams casino ($15 per dozen), a 10-ounce cheeseburger ($14) and comfort food such as short-rib stroganoff ($22), stuffed peppers ($16) and pork shank with spaetzle ($25). There will be rotating daily specials such as chicken pot pie ($16) on Tuesdays, a seafood boil ($32) on Fridays and fried chicken ($16) on Sundays. The menu also has contemporary touches such as tuna tartare (market price), grilled beet salad ($10), a jerk lobster roll ($21) and a farro bowl with chickpeas and feta ($10). Craft cocktails cost $12, and the compact wine list is heavy on California labels. 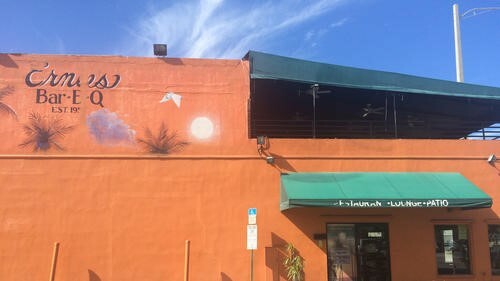 The only nod to Ernie’s comes with a sign pointing to the “original rooftop bar” and a staircase lined with photos saluting classic, independent Fort Lauderdale landmarks including Ernie’s (established 1957), the Elbo Room (1938), the Floridian (1941), Lester’s Diner (1966), Anthony’s Runway 84 (1982), Cafe Seville (1986) and the first Anthony’s Coal Fired Pizza (2002). 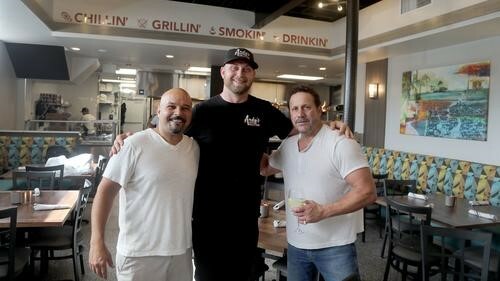 A few hours before Friday’s opening, Bruno, business partner Michelangelo Mozzicato and executive chef Kyle Dowgiewicz scurried about the kitchen and dining room. Managers and servers set tables, unloaded boxes and put on finishing touches. The sound system blared the Rolling Stones’ “Start Me Up.” Bruno filled wine coolers with California chardonnay. Dowgiewicz prepped skin-on snapper fillets for grilling. Mozzicato brought a bottle of chilled Veuve Clicquot champagne to the kitchen, where the staff would toast the long-awaited opening. Bruno had the look of an expectant father. “It’s been torture,” he says. There were delays with permitting and construction. “We were hoping to open in October.” In coming weeks, Bruno will open Anthony’s Pronto Kitchen in downtown Fort Lauderdale. So much for a relaxing holiday season. “Usually I’d be in the Keys now,” he says.Bruno and Mozzicato bought the Ernie’s property for $1.45 million from Butch Samp (the Floridian) in March 2017, according to public records. Just before the sale, Ernie’s closed after 60 years, triggering an outcry from longtime customers who remembered the bootlegging days of founder Ernie Siebert and the original “Dirty Ernie’s” bar. Bruno says he originally intended to lease out the property, but he decided to start another restaurant after his involvement with Anthony’s Coal Fired Pizza greatly diminished in 2017. Bruno says he still sits on the board of directors of the pizza chain, but his consulting contract with the corporate group that bought Anthony’s in 2015 lapsed. The chain now has 68 locations in eight states. Bruno and Mozzicato, the original chef, launched Anthony’s Coal Fired Pizza in 2002, a few blocks south of Ernie’s/Andy’s and near Anthony’s Runway 84 on State Road 84. And now, YachtEZ Import And Export has acquired the talents of Michelangelo Mozzicato as a Yacht & Ship licensed Salesman and overall company impresario as a boat owner, designer, and boat builder, launching his home base in Fort Lauderdale at his own office location at 2005 SW 8th Street, Ft. Lauderdale, FL 33316. You could say Andy’s is more our company home base than the office. Come in and talk boats, food, and of course appropriate beverages with locals that know what is the best in town to see and be seen. Andy’s Live Fire Grill, 1843 S. Federal Highway, Fort Lauderdale, 954-903-9945, or Facebook.com/AndysLiveFire, will be open for dinner 4-10 p.m. nightly (until 11 p.m. Friday-Saturday), with daily lunch service (11 a.m.-4 p.m.) starting in January, 2019.